This seems pretty cool! It looks like they're holding (another?) Eva Expo in Beijing starting on October 1st. Now if they'd only give us Chinese dress Mari and Asuka figures to go with that Rei! Someday I hope that we'll be reunited if that is what's destined to be. Perhaps we'll discover that elusive bible. And then we will finally be free! The girls in qipao came out last year, the guys are new for this year. Admission at 70 RMB, ~$11. Rei seems to be a hit with the Chinese. What is Kaworu doing with his right hand? 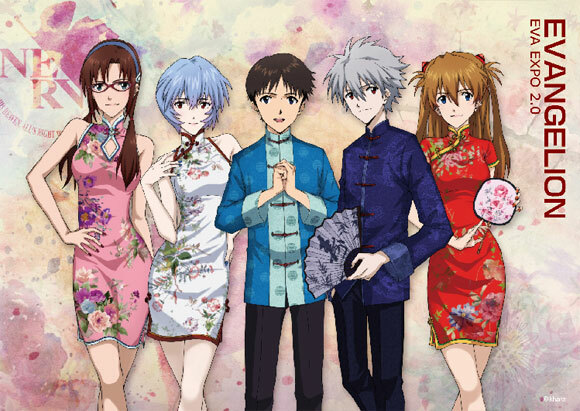 Rei is first in the series for that Chinese dress set, if I remember the Eva Fan tweet for EGF correctly. AR-99 wrote: What is Kaworu doing with his right hand? He put it into his trouser's pocket.